Well known fact that the various ‘anonymous’ movements have helped countless people overcome their addictions. Today, I am just borrowing a point that is very pertinent to living as an entrepreneur. 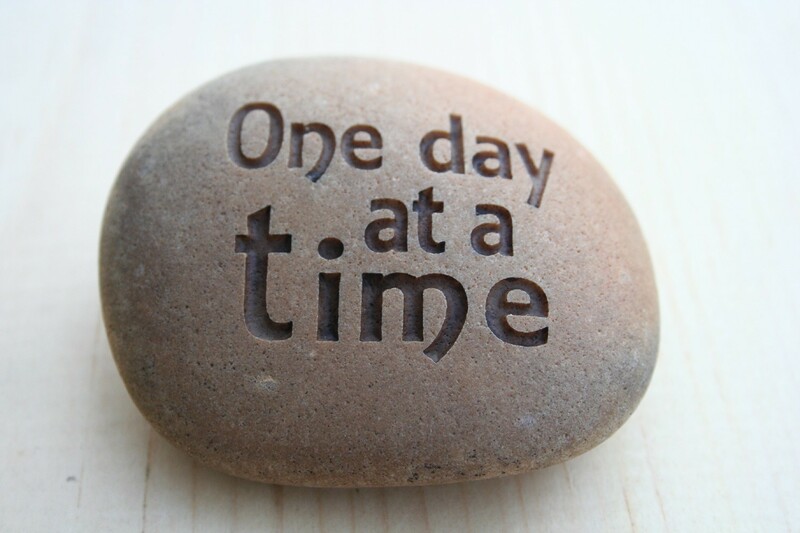 Alcoholics Anonymous is a “one day at a time” way of living. We try to break life into small pieces we can handle. We stay sober one day at a time, or when necessary, one hour at a time. We do our jobs one task at a time,. We solve our problems one problem at a time…. That quote came from an Alcoholics Anonymous Milwaukee Area website. …”Network Marketing” Anonymous is a “one day at a time” way of living… – This represents the life you envision working your business. Time and Financial Freedom. Being your own Boss, working at your leisure, doing what you love, helping others, treating yourself and your family without having to count the pennies to do it, etc. etc. It’s a great life. That’s why you started this business and that’s where you are heading. That’s the goal. …We try to break life into small pieces we can handle… – Ok, so you have a clear vision of what life will be like. But it does not happen immediately and it doesn’t happen over night. It takes work and perseverance. When we market our business opportunities, we often times show off how much money can be made and how easily. But let’s tell the truth – at the very beginning…it’s NOT that quick and easy. You do have to make it through the learning curve, and some curves are longer or shorter, higher or lower than others. And this is the time when you look at your goal and think… ‘I can’t do this!’ But you can! Break your goal into small pieces you can handle. Take the big goal and make little goals. Break the 12 month goal into monthly goals, into weekly goals, into daily goals. What do you need to to TODAY…just today? Get that done. Then tomorrow, do what you need to do for tomorrow. And then the next day and then the next. In three months you would have created a life style. A way of living. …We stay sober one day at a time, or when necessary, one hour at a time… – We can actually use this quote just as it is, except, we’ll use the word sober to mean “not going crazy” So yeah,…we stay “not going crazy” one day at a time or when necessary, one hour at a time. This is REAL!!! Just focus on the task at hand right now! What are you working on in this one hour? Just do it! Don’t drive yourself crazy thinking about all the other things you need to do, and the fact that there are only 24 hours in a day. Just focus on the here and now. Are you writing and syndicating a blog post in this hour? Then do just that. and just do that. …We do our jobs one task at a time… – Exactly!!! Well said!!! There is a lot of work to be done – prospecting, presentations, follow up, coaching, phone calls, meetings, emails, not to mention life outside of business – day jobs, dinner, homework, diapers, bottles etc etc etc. But what can we do??? How can we do it all??? One task at a time! And maybe we won’t get EVERYTHING done today. It probably wasn’t going to be possible to do so to begin with, so don’t worry about that…just do your job – One task at a time. …We solve our problems one problem at a time… – “how the heck does this SEO thing work”, “what is a Keyword anyway?”, “how do I get clients?”, “What do I write?”, “How do I overcome my fear of talking to people”, “How do I process my taxes?”, “My Facebook account was shut down”, “YouTube took down my videos” etc. etc. etc. and another million and one problems we encounter as entrepreneurs. Entrepreneurship may offer you your dream life, but you still live in the real world. Yes, there will be problems! But guess what? You don’t have to solve them all at once. Take one problem and solve that. Maybe the most urgent one. Then move on to the next. Many times, solving one problem actually helps solve the next. And sometimes, problems just fall away of themselves. Either way, don’t try to carry the world on your shoulders…it’s way too heavy. Be honest with yourself, pick one thing and work it out. You will never be given more that you can bear, so have some faith, be patient with yourself, don’t give in to anger or negative thoughts, just shrug your shoulders, roll up your sleeves and tackle the problems – ONE at a time. This entry was posted in Uncategorized and tagged Alcoholics Anonymous, entrepreneurship, network marketing, starting a business on January 26, 2014 by The Woman Hood.